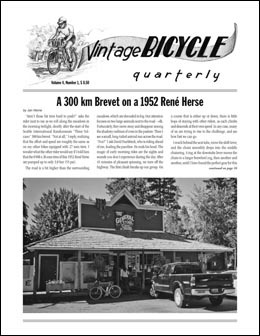 When our editor decided to ride a 1952 René Herse on the famous (or infamous) “3 Pass 300 km” brevet, which includes the gravel of Babyshoe Pass, we didn’t think it would be more than just a good story. When the bike set a new record over this challenging course, it became apparent that there was more to these machines than just their beauty and flawless execution. The full report from that ride is in this issue. Perhaps even more fun than this extraordinary ride are the memories of Jean Olbrechts, who rode for Alex Singer in the Belgian Technical Trials. Illustrated by previously unpublished photos from Olbrecht’s archives, his stories and reminiscences are priceless, and it becomes obvious that these riders not only knew how to ride fast, they also had a lot of fun. Daniel Rebour’s drawings of the bikes at the Belgian Technical Trials complete this wonderful interview. Staying with the Technical Trials, we report from the 4 Jours de Paris (4 Days of Paris), the first post-war Technical Trials. We examine a René Herse from the following year’s Technical Trials in detail, and look at the impact the Technical Trials had on bicycle design. This issue also starts our Builders Speak series, with Peter Weigle showing you step by step how he carves his beautiful lugs. A must-read for any aspiring framebuilder, and those who just admire beautiful lugwork.